THE PRESIDENT OF the Irish Farmers’ Association (IFA) has said the threatened 48-hour blockade of meat factories will definitely go ahead tomorrow. Talks between farmers and industry representatives broke down last night in the dispute over beef prices paid to farmers by factories. IFA President Eddie Downey said not enough progress has been made on the key issue of the gap between Irish and UK cattle prices. He said the meat factories must reflect the higher market returns back to farmers. 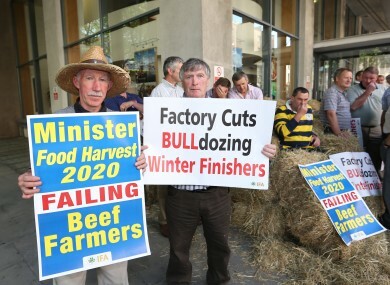 After over eight hours of discussions on specifications under the chairmanship of Michael Dowling with the meat factories yesterday, Downey said progress was made, but there are still outstanding issues. From 3pm tomorrow, thousands of farmers will be stationed outside meat plants around the country and will remain there for 48 hours. Over 10,000 farmers took part in a similar 24-hour protest last month which brought meat factories to a standstill. Email “Thousands of Irish farmers will blockade meat factories for 48-hours”. Feedback on “Thousands of Irish farmers will blockade meat factories for 48-hours”.